SÃO PAULO, BRAZIL – The largest city in Brazil, São Paulo is known for its high rises and bustling business community, but twenty minutes from the busy Avenida Paulista with its banks and corporate offices, lies Vila Madalena, an artsy bohemian neighborhood with lots of galleries, hip shops, and ateliers. For those staying in the city during the World Cup, a walk around the ‘Vila’ in the afternoon will provide a surprising change of pace. View of Beco do Batman, one of the attractions in Vila Madalena, photo by Lise Alves. 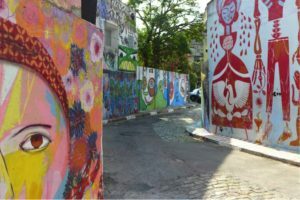 The first stop for visitors is Beco do Batman, an alleyway (on Rua Goncalo Afonso) filled with graffiti that has made headlines around the world. Graffiti artists are constantly updating their masterpieces and an empty white space on the wall is virtually impossible to find. Just around the corner at Rua Medeiros de Albuquerque 250, visitors are wise to check out Choque Cultural, an art gallery specializing in pop, street art. Some of the best new Brazilian street art artists are said to have work displayed here and the spot is also known to host impromptu jam sessions with local musicians at the gallery. A few yards away, on Rua Harmonia 161, is La da Venda, one of the most charming places in Vila Madalena. La da Venda has a little of everything: from tea sets to embroidered table cloths and toys – mostly made from sustainable raw materials. It also has a space where visitors may sit down and enjoy a cup of coffee with a large selection of cakes and sweets. Just down the street at Retro 63 one finds very trendy furniture and objects from the 1950s, 1960s and 1970s. 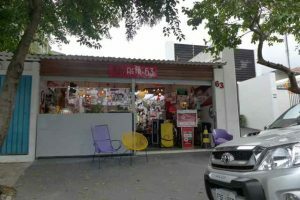 One of the many specialty shops in Vila Madalena, photo by Larissa C. Silva. Vila Madalena’s main attractions are located on a four block radius extending from Rua Harmonia to Rua Fradique Coutinho and from Rua Luis Murat to Rua Purpurina. There are dozens of specialty shops up and down Rua Aspicuelta, such as Doces Laura (sweets), La Spina (decorated boxes), and Sou Sou (jewelry). Although the neighborhood is well-known for its nightlife, there are a few places one should not miss while touring the region during the day. One of those is the Empanadas Bar, on Rua Wizard, right across the street from the neighborhood’s 24-hour ‘padaria’ the Villa Grano. The Empanadas Bar is said to be the first place to sell the tasty meat-filled pastry in São Paulo. Although it now sells a variety of fillings, the traditional meat-filled is still a favorite among customers. Although the walk may be at times demanding due to the steep inclinations of the streets, the stroll is worth it. Many local artists have opened their workshops to visitors, selling much of their wares on the spot. Calu Fontes, for example, has a space with her name at Rua Luis Anhaia 91, where she shows and sells vases, ceramic tiles and plates, all of which she has painted herself. The shop Rodolfo Penteado not only sells original jewelry pieces designed by Penteado himself but also holds classes for those interested in learning how to make their own unique pieces. After all the walking and exploring, many enjoy recuperating at Melograno, an oasis in the middle of the chaos. The restaurant’s menu suggests beers to accompany its many sandwiches and pizzas. According to Melograno’s waiters there are 170 brands of beers from all over the world available at the restaurant.